PENFIELD – The Past Exalted Rulers Association of the Clearfield Elks Lodge No. 540 will host its 25th Annual High Country Arts & Crafts Fair on July 7. It will take place from 10 p.m. – 5 p.m. at S.B. Elliott State Park located off Route 153 north between Clearfield and Penfield. Free shuttle service is provided between the parking area and the event. The Past Exalted Rulers will prepare more than 1,000 barbeque chicken dinners, as well as meatball and hot sausage sandwiches, hot dogs and pierogies, cold drinks and homemade desserts. Proceeds from the food sales will benefit local and Elk’s charities. Chicken dinner tickets can be purchased in advance at the Elks Lodge located at 301 N. Second St., Clearfield, or from any Past Exalted Ruler. Tickets will also be available for sale the day of the event at the front porch of the PA Center. 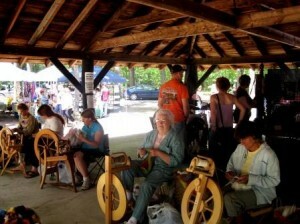 The event will feature 165 arts and crafts vendors from across Pennsylvania. Vendors will offer “unique” items that show the “wide-ranging talents” of Pennsylvanians. Vendors will offer distinctive and varied jewelry; woodcrafts and furniture; floral arrangements; plants and herbs; crochet, knitted and fabric crafts; seasonal, outdoor and indoor décor; tole painting; candles; bath and body products; smoked cheeses; hand-mixed dips, rubs, seasonings and spice blends; homemade jams and jellies; pottery; caricatures; rugs; alpaca clothing toys and blankets; barn wood crafts; primitives; leather goods; Intarsia; honey; children’s furniture and much more. Bonnie Whaling and her group of spinners will provide wool spinning demonstrations, and T&D Carvings of Brockport will provide chainsaw carving. The Susquehanna Antique Machinery Association will churn homemade ice cream. Entertainment will be provided throughout the day, including Dennie Huber, a balloon artist and magician of Altoona, from 11 a.m. – 1 p.m. Local country music artist Jerry Schickling will perform for approximately three hours throughout the afternoon. Organist Robert Guarino will play popular tunes on the front porch of the PA Center. The event is continually successful due the work of 90-plus volunteers; the cooperation of the state’s Department of Conservation and Natural Resources and current and past park managers at both Parker Dam and S.B. Elliott State Parks. The sponsor of the High Country Arts and Crafts Fair is the Past Exalted Rulers Association of the Benevolent & Protective Order of Elks of the United States of America, Clearfield Lodge No. 540. As a result of this event, the P.E.R. Association will donate several thousands of dollars to local and Elks’ charities. Those charities include: the Scouting programs; Clearfield High School Field House; Music Boosters; sports programs; Marian House women’s shelter; Clearfield Emergency Medical Services; Clearfield Ministerium Food Bank; Clearfield County Area Agency on Aging; Salvation Army; Clearfield-Lawrence Airport; Clearfield-Jefferson Red Cross; Clearfield High School Swim Team; Elks’ Charities & Scholarships; and many others. For additional information, please contact Bev or Bill at 814-765-5667 or blawhead@verizon.net.